Forty years ago today Britain went to the polls to decide a crucial question: would the country remain in the European Economic Community (EEC)? It had only joined the EEC, the EU forerunner organisation, two years previously, and this was the first UK-wide referendum. When the votes were counted the results were emphatic. The nation had voted ‘yes’ to Europe by a two to one margin. The Labour Prime Minister Harold Wilson hailed the result, noting that no one in Britain or the wider world could be in doubt about its meaning. 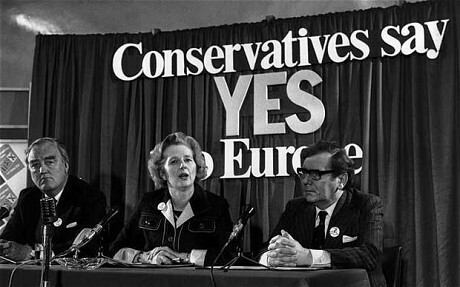 Margaret Thatcher, the recently-chosen Tory leader, observed that the ‘massive “Yes” vote could not have come about without a massive Conservative “Yes”.’ Today, as the British people prepare for a new European plebiscite, what lessons can be learned from the experience of 1975? Some things have remained constant over the last four decades. Even back then, David Dimbleby was one of the faces of TV politics; he hosted a Panorama debate on the EEC. Other things have changed, though, not least the fact that in those days it was the Labour Party that suffered the worst splits over Europe. Anti-European socialists such as Tony Benn and Barbara Castle found themselves at loggerheads with Europhile social democrats such as Roy Jenkins. The 1974 Labour manifesto tried to square the circle, condemning the Heath government’s ‘profound political mistake’ in entering the Community ‘without the consent of the British people’ yet keeping the door open for continued UK membership if the terms could be renegotiated. Although a different party was in charge, the parallels with David Cameron’s current strategy are obvious. Wilson’s renegotiation did succeed, and the British gained concessions on the EEC budget, on the Common Agricultural Policy, and on food imports from Commonwealth countries. Some would argue that the changes that he secured were more nominal than real; today some Eurosceptic Tories fear that Cameron is planning to ‘do a Wilson’ and will use whatever cosmetic reforms he can secure as an excuse to campaign vigorously to stay in the EU. Be that as it may, it is worth noting that many of the key issues have changed, along with the political and economic context. In 1975 Scotland was the most Eurosceptic part of Britain and the SNP campaigned in support on an exit from the EEC. 1970s Europhobes harped on about food prices and the threat to the balance of payments. Little attention was paid to questions of freedom of movement for European workers during the referendum. After all, the EEC was then a club of nine wealthy European nations and Britain’s economy was fairing worse than many of its European neighbours at the time. Now, Cameron’s wish-list focuses on welfare, immigration and political integration. There is, however, also an underlying continuity: the deeper issue in both the old-style and modern debates is that of sovereignty, and the degree to which it should be sacrificed in the interests of other benefits such as access to markets. 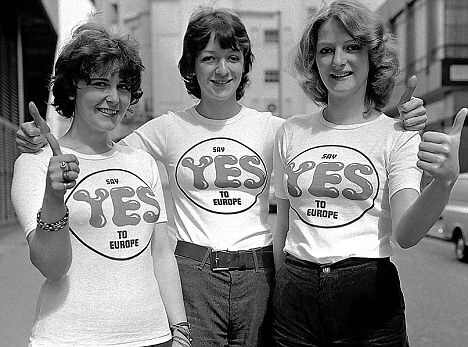 As in 1975, the ‘yes’ campaign is likely to receive significantly greater funding than the supporters of an exit from Europe. Business was overwhelmingly in favour of continued EEC membership in the 1970s, based on perceptions that access to European markets would enable Britain to improve labour productivity and promote high-tech industry. Some opponents of EU membership now argue that the British economy would be better served by having a free hand to develop relationships with emerging markets such as India and China. However, the leading business organisation, the CBI, made clear its keen support for a ‘yes’ vote last week. In the light of the recent announcement that the Bank of England is organising a taskforce to make contingency plans in the event of a British exit from the EU it is worth noting that government departments organised similar operations forty years ago. A Treasury memo produced in 1975 claimed that ‘a swift withdrawal is extraordinarily difficult to reconcile with the facts of international political life’. Some ministers called for a withdrawal from the Community no later than 1 January 1976. And yet, behind the scenes civil servants raised the concerns about the viability of negotiating an early exit, meaning that Britain’s budget commitments would remain in place for another year. There was no legal basis for the withdrawal of a member state, so the logistics of renegotiating trade relationships and implementing exit were uncertain. If the British electorate decides to leave the EU in the forthcoming referendum, the example of 1975 suggests that it would only be the beginning of a complex process of renegotiating a new relationship with Europe.